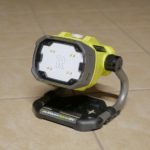 Ryobi released the 18V Hybrid LED Project Light P790 earlier this year and in this article we review this new light and check it out. 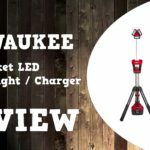 This light has an 360 degree/articulating panel with an array of LED’s and paired with 900 lumens makes it a great light for table top use and it’s included hook makes it great for hanging overhead. 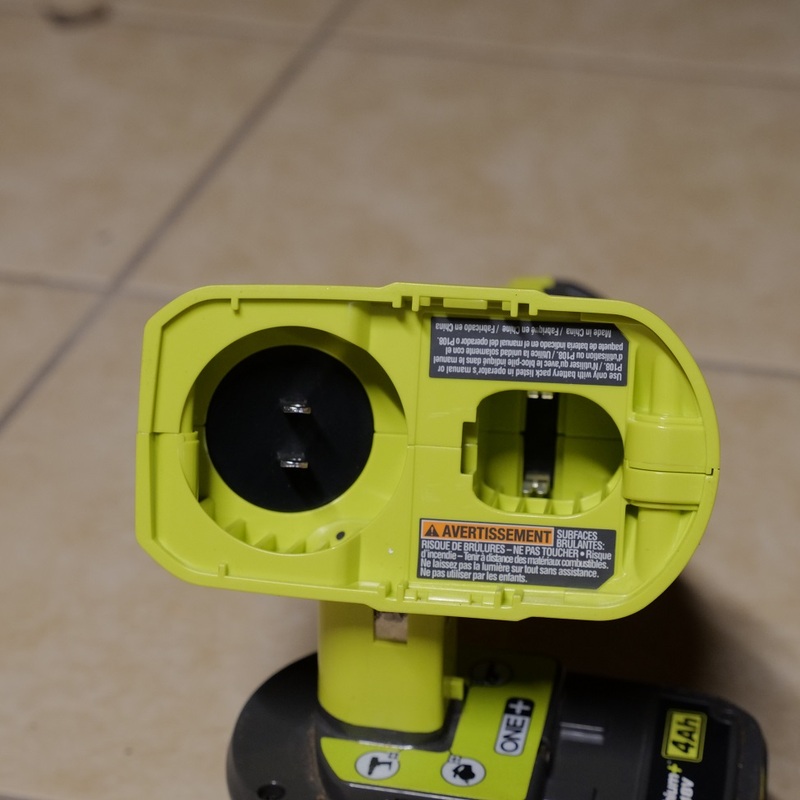 Ryobi was kind enough to provide the 18V Hybrid LED Project Light P790 at no cost for review. However as with all my reviews, I am not paid, sponsored, or obligated to give a positive review. This review is my opinion of the product based on my usage and knowledge and my review will reflect what I like and dislike about the product. I will do my best to provide you with an unbiased review. My goal with this review is not to push/sell the product but instead to explain the good along with the bad so that you can make an informed buying decision and determine if this product is worth buying. Buy it now links are provided for this product as a courtesy and convenience for you the readers and are also provided to help support the Tool Craze website so I can offer more free content. 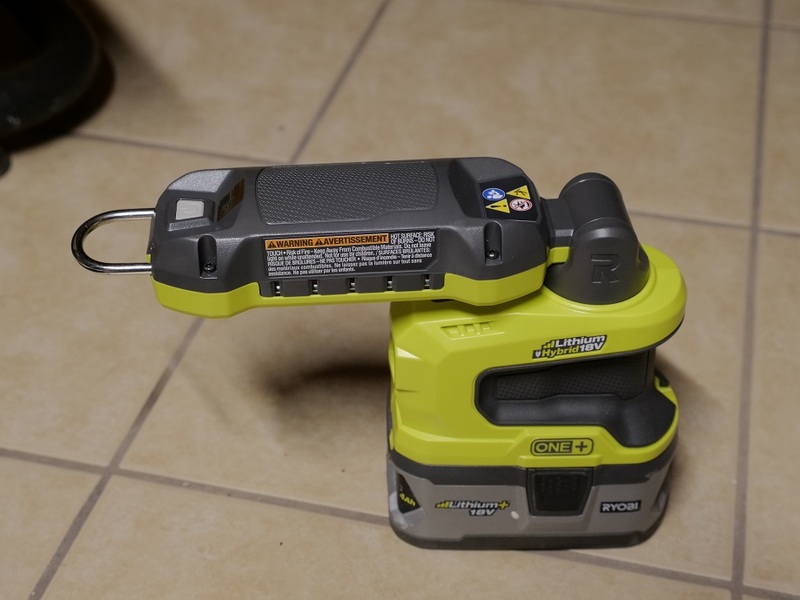 Being a hybrid light, it can accept Ryobi 18V batteries making it completely cordless or you can plug into an extension cord for unlimited runtime. 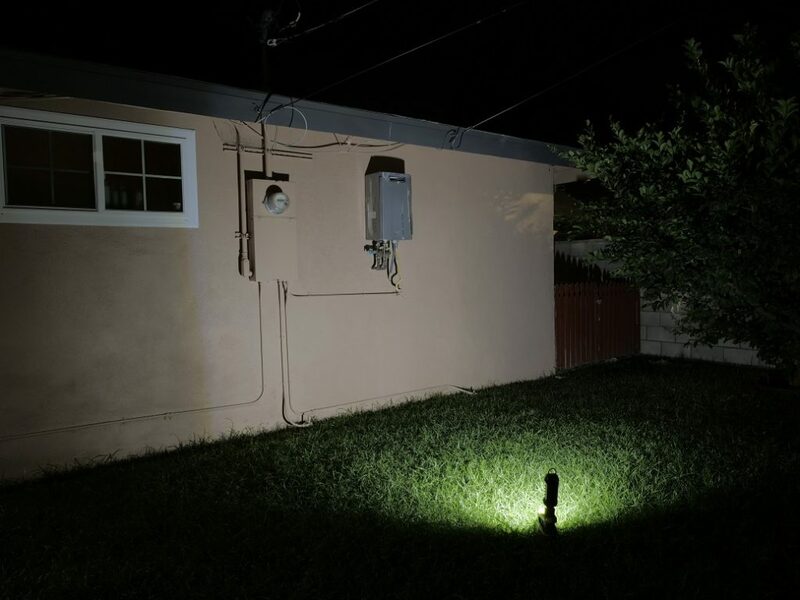 3 light settings of high medium and low allow you to go down to 600 and 100 lumens when the full 900 lumens is too bright. There’s a push on/off button on the back of the light head to power on the light and cycle through it’s light brightness settings. And just like their cordless drills and impacts, this light also has their mag tray (magnetic tray) which makes it good for when working on small parts (electrical) to put a few screws or bits while you work. 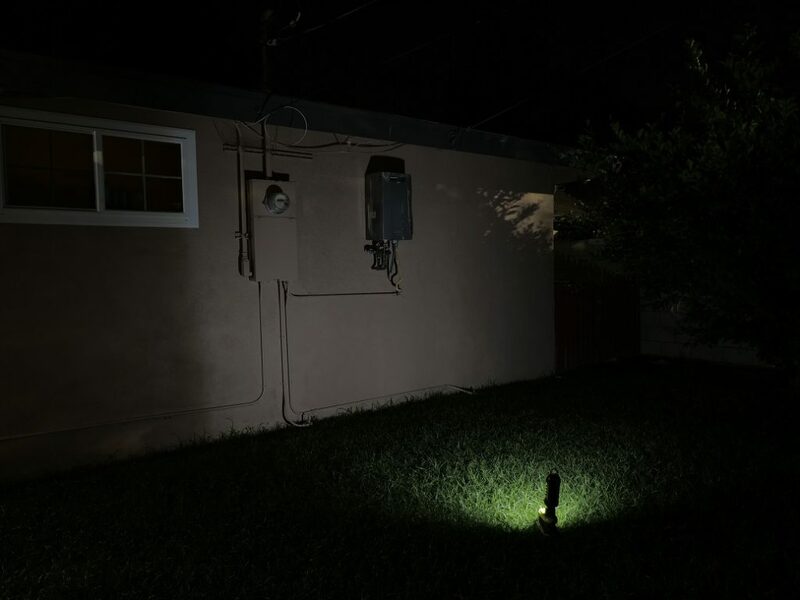 At only 900 lumens at max brightness, it’s got good brightness for small up close areas however not the brightest light by any means. The medium setting has less light output than max however the difference is slight while you’ll see a big difference in output at it’s lowest setting where it’s best used to conserve power and when very little light output is needed. The light quality is very good and is mostly even and no visible hotspots like cheapo LED lights. The light is very even and smooth in the center where it gradually steps lighter at the edges of the light. The light output is shaped like the light itself and is taller than it is wide. It has a is very good neutral white balance. The light output color is white which is a huge improvement over some crappy LED lights that have a very cool “blue” tint. The white color balance will render items to show their true colors without any tint skewing. 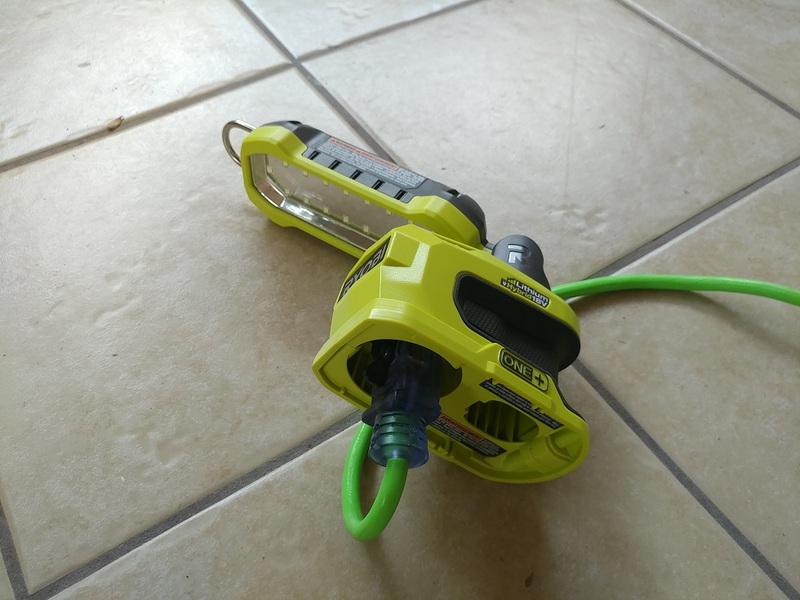 This is great for when working with electrical, especially low voltage rainbow assortment string of wires where this light’s output will allow you to see blue’s as blue and yellows as yellow and so forth. 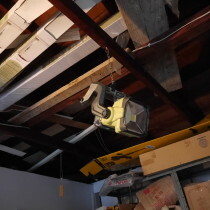 The light has an articulating head and can pivot all the way down and all the way back to face up and it can also rotate sideways giving you many options to angle the light. 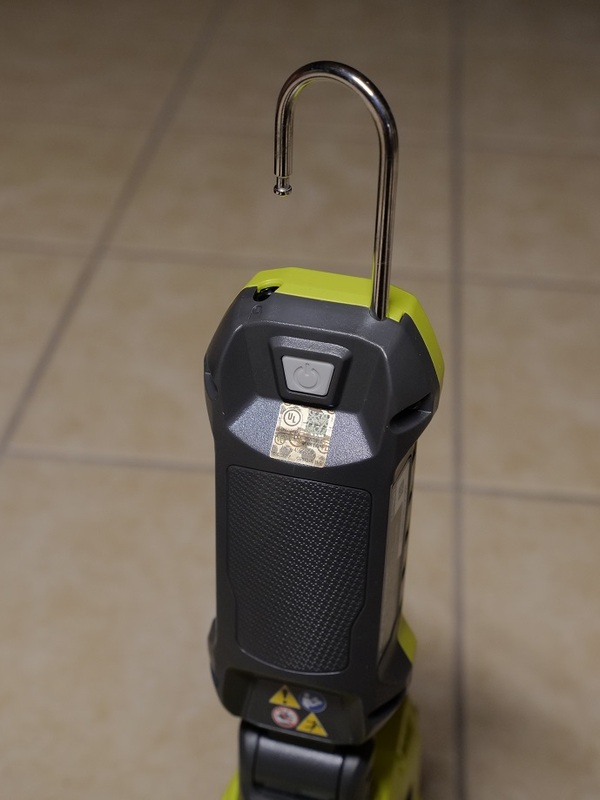 There’s a built in hook at the top of the head which works very similarly to some of Milwaukee’s lights that have this same hook which gives this light the ability to hang when needed such as when you’re working on your car for hands-free over-head operation. 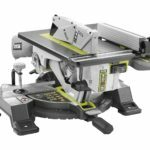 The light’s build quality is excellent and something along the lines of what you would find on a Milwaukee, Makita and Dewalt tool. There’s also a grip on the base of the tool that’s recessed for your hands. It reminds me of how a drywall screw gun fits in your hand (sort of). But because it’s recessed quite a bit, it’s not the most ergonomic, but at least they tried to make it ergonomic. 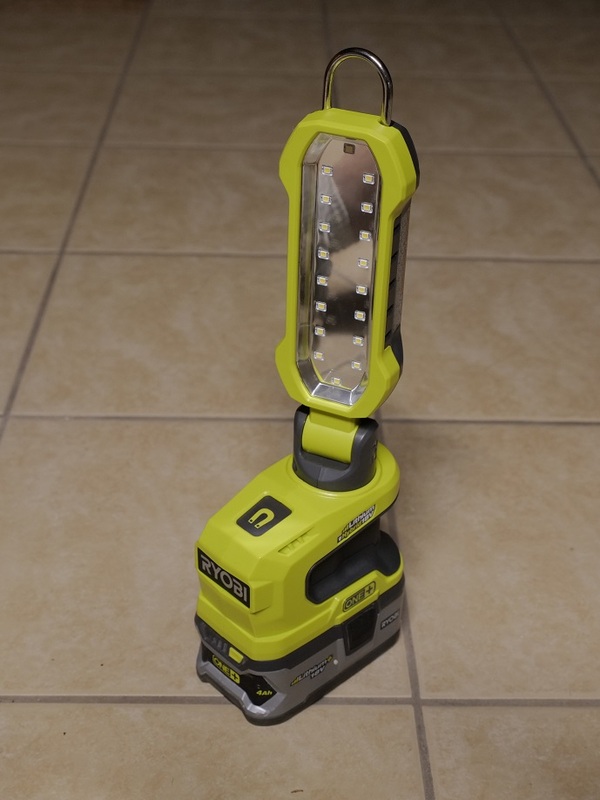 What I don’t get is that this light is designed to stand on it’s own with the battery but it doesn’t appear to be able to stand on it’s own if you plug it into an extension cord. Doesn’t seem very practical when plugged in. Maybe the hybrid AC function is a gimmick? 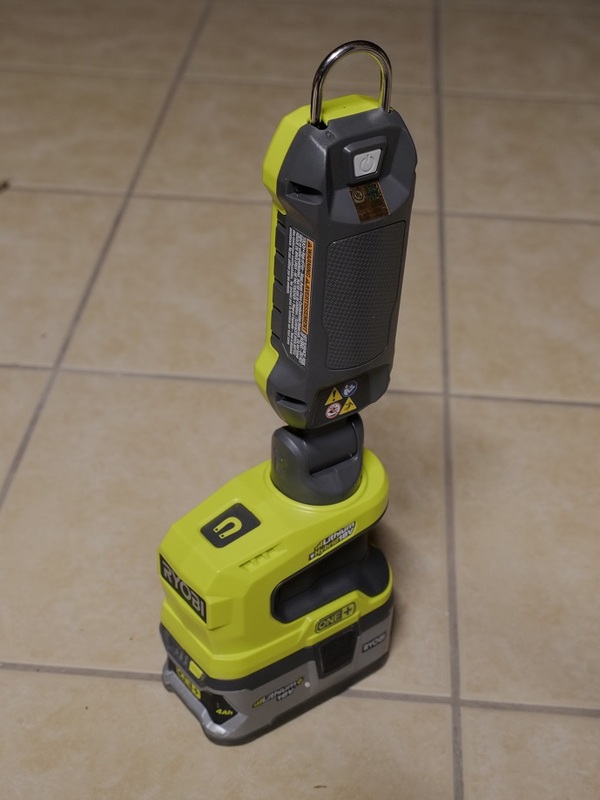 The AC funtion works and my opinion is that it’s only good for when you are hanging the light when it’s plugged in or are hand holding the light otherwise your only choice is battery power if you want it to stand on it’s own. The price at time of writing was $39.98 however the regular price appears to be $49.98 as it seems to be on sale or a temporary price slash of $10 off the regular price. 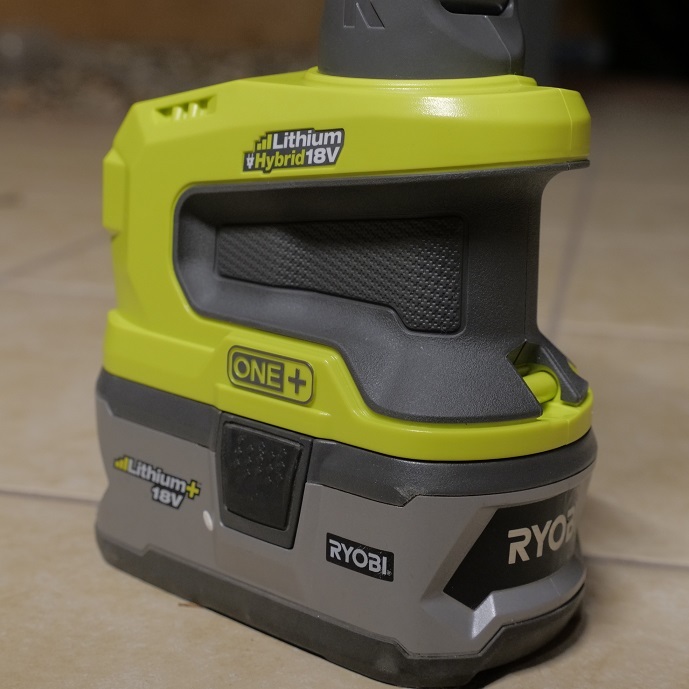 I’d say that this is a very good light if you’re on the Ryobi 18V system and looking for a light you can hang with decent brightness and quality light output. 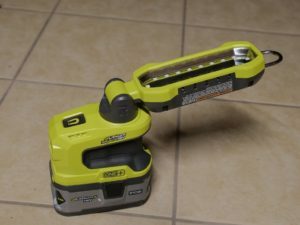 There’s not much to complain about as Ryobi did a great job with this light and is priced right and you can power it with Ryobi 18V batteries or plug into extension cords but the only problem is that it can’t stand on it’s own when plugged in but only good for hanging when using AC power. Otherwise it’s a great light.